Preheat oven to 230°C/450°F. Roll out the pizza dough and place on a baking sheet lined with parchment paper, if needed. Wash broccoli, remove the stalk, and divide into small florets. Cut Gorgonzola into cubes and roughly chop almonds. Bake pizza dough in the oven on the lower rack for approx. 4 min., then remove from oven and allow to cool slightly. 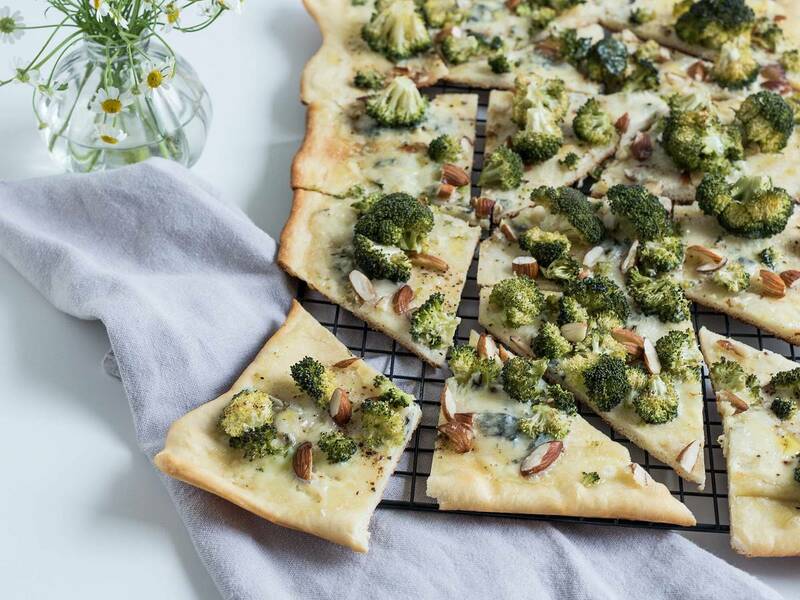 Spread mascarpone onto the dough, distribute broccoli and gorgonzola evenly on top, and sprinkle with chopped almonds. Drizzle pizza with olive oil and season with salt and pepper to taste. Transfer to oven and bake on lower rack at 230°C/450°F for approx. 10 – 15 min., or until golden and crisp. Enjoy!